"Astrolojew" at Mystic Mountain in the Holy City of Tzfat! For those of you who were able to attend the special presentation at Mystic Mountain in Tzfat on November 28th, it was wonderful to see you all! For those of you who couldn't make it - sorry to miss you! 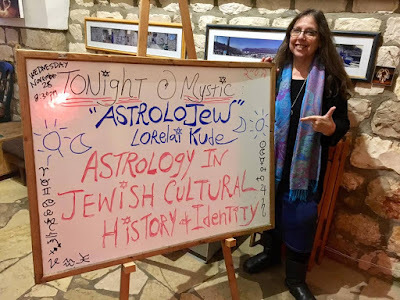 For ALL of you: here's a link to a folder which contains an audio recording of last night's presentation on Astrology in Jewish Cultural History, as well as a PDF of the PowerPoint with visual accompaniments and notes. 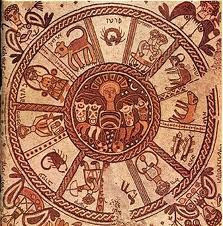 Parshat Vayetzi - "Birth of a Nation"
#‎Vayetzei‬ - "Birth of a Nation"
The Parsha this week tells the birth-story of 11 out of 12 of the Tribal Patriarchs, laying the foundation for understanding the Cycle of Sacred Time which is the Jewish Year, as reflected by Jewish Astrology. The order in which sons of Jacob were born, the spiritual identities of the four mothers who birthed them, and their unique Tribal functions, both outwardly in physical reality as well as inwardly in the realm of symbols and archetypes operating within the individual personality, all have their seeds in this week's Torah portion. The 12 Tribes correspond to the 12 constellations. This week it's "Birth of a Nation." Later on in Parshat BaMidbar, the appointed directions and functions of the now-mature Tribes are described in exact detail. "As Above - So Below." The 12 Tribes around the Mishkan (Tabernacle) is the reflection of the heavenly arrangement. Recreated in exact detail each of the 42 times they encamped in the desert, as if to indelibly stamp this power-configuration into our very DNA, this arrangement is the sacred mandala of the Israelites. New Moon at 15 degrees Scorpio today (Wednesday November 7th), Rosh Chodesh #Kislev tonight through Friday (2 days this year). We welcome the Hebrew month of Kislev Nov. 8-9. Kislev is connected to the mutable fire sign Sagittarius (Keshet, the bow), the Tribe of Benjamin and the traditionally beneficent planet Jupiter (Tzedek). The Holy of Holies was built upon a tiny bit of Benjamin’s tribal land during the time that the Temple stood in Jerusalem. Just as the Temple gave spiritual light to the world, Kislev gives spiritual light to the soul during the darkest part of the year. This year, Kislev begins 13 days before the Sun enters Sagittarius on the solar calendar. This gives most of November a Scorpio-Sagittarius (Mars-Jupiter) flavor, supersized by Jupiter’s return to his home sign of Sagittarius on Nov. 8 for the first time since Nov. 2006-Dec. 2007 and multiplied by Mercury retrograde in Sagittarius/Scorpio from Nov. 16 through Dec. 6. Jupiter’s propensity for devotion can be seen in how Benjamin named his ten sons for life events connecting him to his supposedly lost brother Joseph. Sagittarius the Archer is brutally honest, aiming for the highest truth with his bow, shooting right through convention, tradition and the status-quo to reach the heart of the matter. 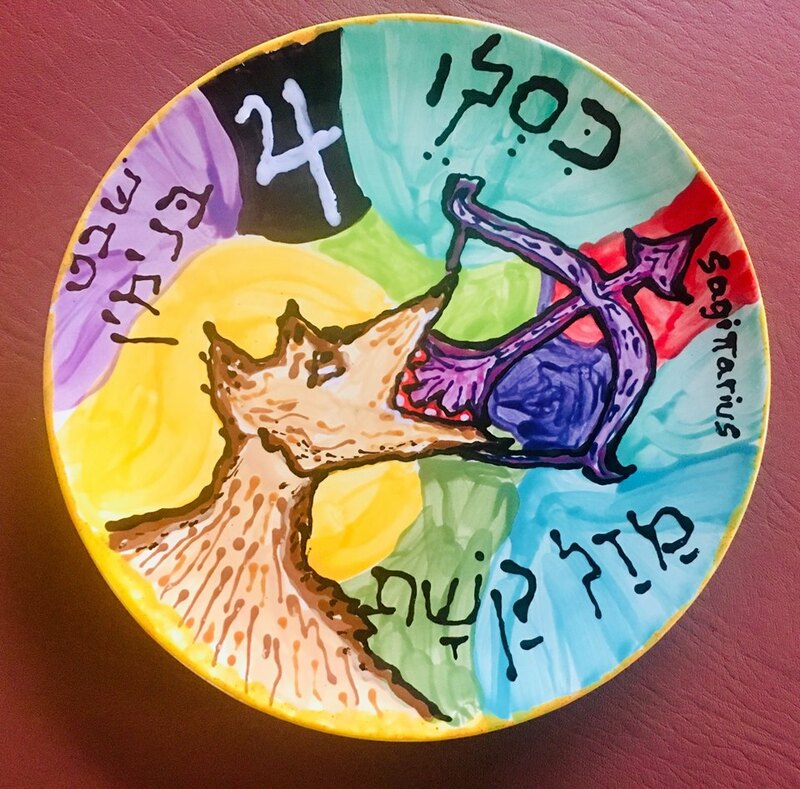 Pictured: Ceramic plate from my "12 Tribes" Series, Kislev/Benyamin/Keshet. Benyamin is portrayed as the "Wolf" of Genesis 49:27. Note the glyph for the planet Jupiter ("Tzedek" ), the ruling planet of Sagittarius. Astrology Classes Online and In-Person Coming in January 2019! It's never too soon to schedule Astrology learning opportunities for 2019! TWO Classes Coming in January 2019! 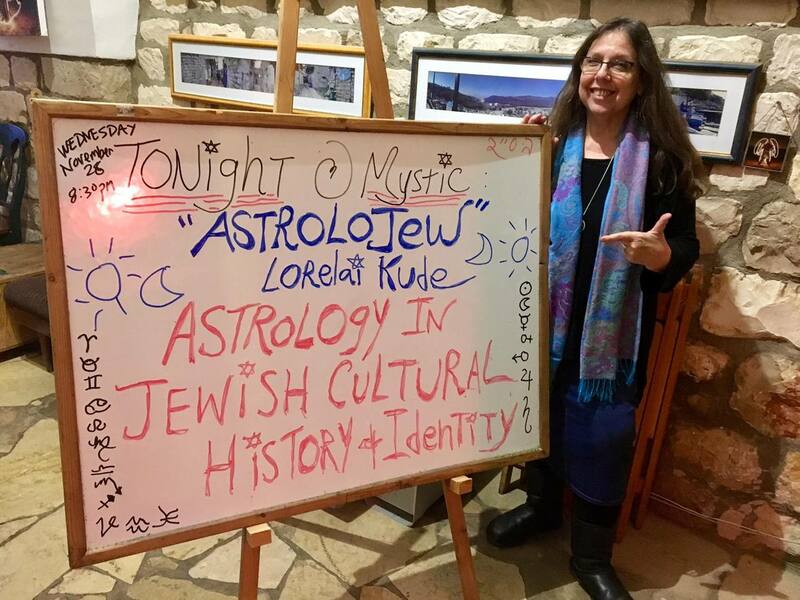 The successful completion of this 12-part course will equip students in the basics of astrology and the Jewish and Kabbalistic astrological methods, as developed by Lorelai Kude, MA (“Astrolojew”), during 35+ years of professional practice. 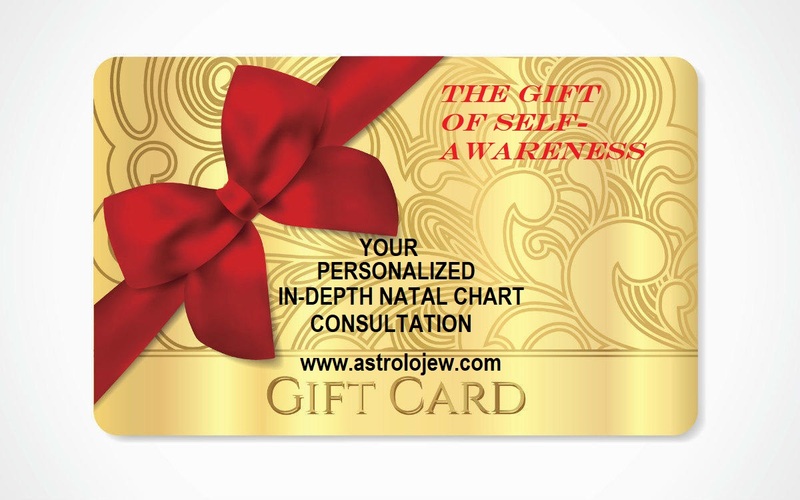 At the end of the course, participants will be able to read and understand their own personal natal chart and will possess the skills to begin reading the charts of other people. Students will gain valuable insights and “best practices” for their own careers in astrology. Tuition for the 12-part course is $360. Classes will be held online in an interactive digital environment (Zoom or Google Hangouts, still to be determined). Contact lorelaikude@yahoo.com for details about the curriculum and to register. COMING TO THE EAST BAY JCC IN JANUARY 2019! This engaging, interactive class for Teens 11-18 will present an age-appropriate introduction to the foundations of Jewish mysticism via a hands-on engagement with text, art and artifact drawn from the Jewish mystical tradition. Each two-hour class will combine text-based learning from classical sources such as the Torah, Talmud, Sefer Yetzirah, selected writings of the medieval commentators such as Ibn Ezra, and the Zohar, with the opportunity for students to use the arts to creatively respond to the ideas they’re encountering. This 10-session course will draw from three major areas of the Jewish mystical tradition: astrology, kabbalah, and magic. Session 2 February 19th, 26th, March 5th, 12th, 19, and 26th. Class cost 175$ for each 6 Weeks classes. (This article appears in the Jerusalem Post's Sukkot Supplement Edition, September 2018). Seven Days of Creation, seven days of the week, seven visible planets. Twelve months of the year, twelve constellations, twelve Tribes. The Jewish mystical tradition perceives the connections between humanity and the starry skies to be one of mutual sympathy: that of macro and microcosm, “As above, so below.” An intriguing illustration of this principle is found in the biblical book of Numbers chapter two where the encampment of the Israelites in the desert is described in detail. During the forty years of wandering in the desert between Egypt and the Land of Canaan, they were commanded to pitch their camp in the same configuration every time. The LORD spoke to Moses and Aaron, saying: The Israelites shall camp each with his standard, under the banners of their ancestral house; they shall camp around the Tent of Meeting at a distance. Camped on the front, or east side: the standard of the division of Judah, troop by troop…camping next to it: the tribe of Issachar…the tribe of Zebulun…on the south: the standard of the division of Reuben, troop by troop…camping next to it: the tribe of Shimon…and the tribe of Gad…on the west: the standard of the division of Ephraim, troop by troop…next to it: Manasseh…and the tribe of Benjamin…On the north: the standard of the division of Dan, troop by troop…camping next to it: the tribe of Asher…and the tribe of Naphtali… (Numbers 2:1-29). 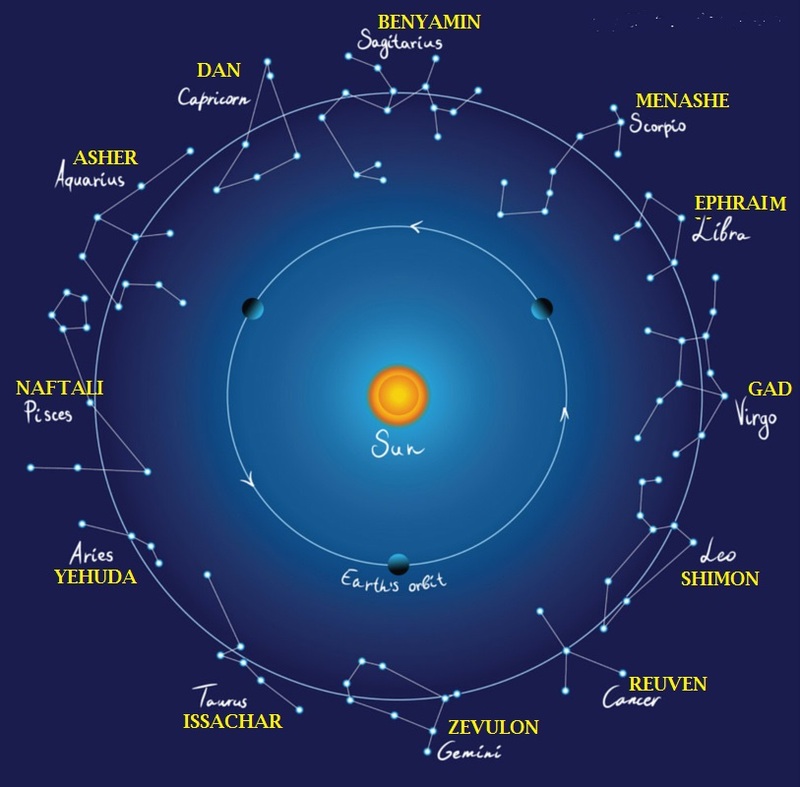 This very specific order of Yehuda (Judah) to the east opposite Ephraim to the west, Dan to the North opposite Reuven to the south is the mirror image of the twelve constellations of the Zodiac and their associated tribes. 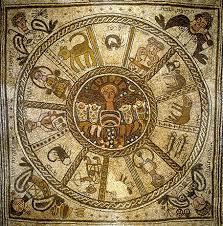 As the constellations of the zodiac surround the earth, the twelve tribes encamped surrounding the tabernacle. While we are no longer collectively encamped as twelve tribes around the Mishkan, the 12-House configuration of the Zodiac is repeated in the natal (birth) charts of countries as well as people. The Modern State of Israel’s natal chart (pictured below) is the starting point for understanding how the movements of the planets above reflect, describe, and act as an energetic conduit upon the goings-on below. The year 5779 begins with a powerful energetic re-alignment as Mercury (Kochav in Hebrew), the planet of communication, enters his home sign of Virgo (Betulah), in Israel’s 11th House (“friends,” community, collective, the claal). The roar and bombast of late summer gives way to cool, clear-headed thinking and rational, pragmatic analytics, particularly in areas around 11th House issues: commonly held collective ideals, beliefs, and values. Mercury in Virgo delineates and defines “who is my friend, and what do we have in common?” As the new year of 5779 kicks off, this question (and some possible answers) are brought to the forefront. Mars (Ma’adin in Hebrew), traditionally known as the planet of war, had been retrograde since mid-June. At the New Year he is now stationed direct and speeding its way through Aquarius (D’li), the sign associated with the Jewish people (and the natural ruler of the 11th House of the zodiac, mentioned above in relation to Mercury’s transit through this House). Aquarius is the most idealistic and humanitarian of all the twelve Zodiac signs – his Tribal ruler Asher’s archetype is that of abundant giving to others and generous supplier of bounty to his brethren. Retrograde Mars in Aquarius takes away instead of giving, leaning towards the particularistic rather than the universal. Things will start to feel “back on track” or normalized as 5779 begins and Israel can reclaim some of her Aquarian / Asher-like energies, seeing herself in a more magnanimous light. The lessons learned when the status-quo goes topsy-turvy need to be incorporated going forward with a more mature and developed collective self-awareness. This is further emphasized by Saturn (Shabbtai in Hebrew), the planet associated with the Jewish people, which also stations direct in the sign of Capricorn (Gidi), after being retrograde since mid-March. Hard work yields some very real results now! Persistence and patience pay off in very tangible ways. Those working behind the scenes for Israel’s good may be rewarded for their toil in very visible ways by the end of 2018. The Moon is particularly important to the Hebrew calendar and the cycle of sacred time which is the Jewish New Year. Lunar phenomena such as eclipses tell the story of the universal energetic archetypes dominant during any given time. This year, four out of five eclipses occur on the Cancer (Sartan) / Capricorn axis. Moon-ruled Cardinal Water sign Cancer’s key words are: food, home, mother, and money. Saturn-ruled Cardinal Earth sign Capricorn is: boundaries, business, father, structures. Both are concerned with issues of security: Cancer with personal and emotional security, Capricorn with external and structural/institutional security. Cancer is your old china “piggy bank” Capricorn is the world bank. Cancer is curling up in your grandmother’s quilt eating comfort food. Capricorn is owning the quilting factory and the food processing plant. Cancer is the Tribe of Reuven, concerned with his mother’s honor, overwrought as his brothers plotted to sell Joseph to a band of traveling nomads, the “initial vigor” of Jacob, who warns his firstborn of the dangers of excessive emotion. Capricorn is Dan, fierce guardian of the furthest boundaries and borders of Israel, a snake by the side of the road ready to strike the heel of the invading horde. These Cancer/Capricorn dynamics flavor the eclipse cycle of the coming year. In Israel’s natal chart, Cancer rules her 9th House and Capricorn her 3rd House. These are the Houses of communication and interface: 3rd House with the immediate environment, and 9th House with that which is exotic, far-away, or foreign. Venus (Noga in Hebrew), Israel’s ruling planet, is in her Cancerian 9th House, which is “Mother Rachel,” crying for her exiled children to come home. Israel’s Parts of Fortune in her Capricorn 3rd House finds the pragmatic, practical path to worldly fortune right in her own backyard. Silicon Valley vs. the Silicon Wadi? Cries of “please come home” and “make Aliyah” followed by economic hardships and bureaucratic impediments to establishing financial security in the Land? In relation to Israel, the eclipse dynamic of the Cancer/Capricorn axis in her 9th and 3rd Houses can be understood as crisis followed by enlightenment around issues of family identity (who is in, who is out of the “family”), the competing of domestic vs. foreign influences and the sum of the bounty and resources each bring to the table, and the balance between emotion and practicality in dealing with security issues. The Full moon at 1-degree Taurus (Shor)on October 24th, which is the full moon of Chodesh Cheshvan, falls directly on Israel’s 7th House Cusp. Partnerships are illuminated, and common causes / shared values are emphasized. Occurring as it does during the Venus Retrograde season, this full moon may bring back an “old friend” or a previously proposed idea or prior partnership, particularly in the peace-making and diplomatic fronts. The Lunar Eclipse / Supermoon / Full moon at 0 degrees Leo (Ariyeh) on Tu b’Shevat (January 20th) falls directly on the Midheaven (MC) of Israel’s natal chart – the most public place in any chart, front and center where everyone can see it. There’s no hiding from what goes on at this critically important location! A lunar eclipse is when the moon’s light is occluded by Earth’s shadow and can only happen on a full moon. In astrological symbolism, “light” is consciousness, and the hiding and then revealing of the Moon’s light during an eclipse enacts the process of revelation. For something to be revealed, it must first be hidden. In the case of this eclipse, what is hidden is hidden in plain sight (the MC or 10th House cusp). Leo is the proud, passionate, “royal,” dramatic and leadership-oriented Fixed Fire sign, the “Ariyeh” or lion, and at the height of Israel’s natal chart, an appropriate guardian of her borders. A dramatic revelation may unfold at this time around Israel’s leadership. 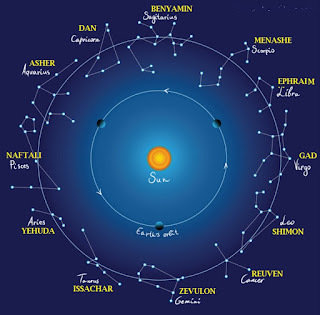 It is worth noting that this eclipse falls in Israeli Prime Minister Benjamin Netanyahu’s 8th House, the place of shared values, valuables, resources, and intimacies (see chart illustration). Secrets may be revealed at this time involving things Bibi “shares” with others (including his constituents), especially material world (Taurus) things. The Full moon of April 19th at 29 degrees of Libra (Moznaim) occurs on Pesach, directly on top of Israel’s 1st House Cusp / Ascendant – her “personality,” so to speak. This is extremely significant in terms of Israel’s identity. This very same sensitive point (29 Libra) was triggered during the Solar Eclipse of October 23, 1957 (four days prior to the Israeli Presidential election), with the Sun and Moon both conjunct at 29 Libra, and again on Oct 23, 1976, another Solar Eclipse at 29 Libra, which marked the end of the Yom Kippur war. Israel (the “Am” / people, not the Modern State) was “born” on Passover, so to speak, so issues of identity are reviewed and confirmed during this special time. Look for identity-renewing actions taken by Israel during April’s full moon and thereafter. The new moon of May 4th at 14 degrees Taurus is conjunct the North Node in Israel’s natal 7th House (partnerships, legal matters, issues of justice and equity). The lunar nodes (north and south), embodied as the T’li (dragon or “hook”) in Judaism’s foundational mystical work, the Sefer Yetzirah, symbolize fate, destiny, and the specific tikkun (fixing) of this lifetime in any natal chart. Israel’s North Node in her 7th House indicates her tikkun, fate, and destiny’s fulfillment lies in partnership: sharing the very earth she was founded upon (Venus-ruled Taurus is the Fixed Earth sign) and redeeming it (Taurus is nature, environmentalism, conservationism, natural resources) in harmonious partnership. An extremely idealized version of this symbolic picture might have been seen in the early days of Israel’s kibbutz movement. The new moon, occurring after sundown on May 4th, kicks off Rosh Chodesh Iyar and the fifteenth day of Sefirot haOmer: Chessed she’b'Tifferet. The earth itself, water resources shared with others, and “territory” come into focus. Best possible outcome for this transit would be a renewed commitment to healing the very land of Eretz Yisrael itself, soil, water, and all natural resources, in partnership with all who share those resources within her. The new moon the early afternoon of June 3rd at 12 Gemini (Taumim) is closely conjunct Israel’s natal Mercury, planet of communication (and ruling planet of Gemini) in Israel’s 8th House. This is Erev Rosh Chodesh Sivan, the 44th day of the Omer: Gevurah Sh’b’Malchut: the manifestation of strength and power into this world. Sivan is the month in which Am Yisrael received the Torah at Mount Sinai, and it is said that we “saw the sounds” as they were being said by G-d, the impact of which was so intense we begged for G-d to allow Moses to tell us the commandments instead, as we could not handle the intensity of the transmission. Mercury’s role as “the Sun’s scribe” mirrors Moses as the scribe of HaShem, is triggered and enhanced by this New moon. In the 8th House, Mercury/Moon speaks “from the heart” to those with whom we share values, valuables, resources, and intimacies. Watch for important communications from the highest levels of government regarding what Israel “shares” with others. The BIG event is the Full moon of June 17th at 25 Sagittarius (Keshet), conjuncts Israel’s natal Jupiter at the Galactic Center: 27 Sagittarius, in her 2nd House. Expansive Jupiter’s key word is “big” – also large, gigantic, super-sized, expansive, enhanced. Jupiter is Tzedek in Hebrew, indicating its beneficent nature, and 27 Sagittarius, the astronomical galactic center, is symbolic of being smack dab in the middle of things – the eye of the storm or the center of the galaxy. Everything revolves around this central point, and the State of Israel’s natal Jupiter here is tremendously fortunate, “lucky,” and blessed. In Israel’s 2nd House those blessings are manifested materially– abundant blessings of the earth and of heaven. The full moon of Chodesh Sivan 5779 promises an outpouring of shefa and bracha, may we see it speedily and in our day! The New moon of Erev Rosh Chodesh Av on July 31st at 8 Leo is located exactly between Israel’s own natal Moon at 4 Leo and Pluto at 12 Leo in the 10th House of Israel’s natal chart. Publicly played-out power struggles and dramatic emotional displays are possible as existing structures are challenged by newcomers (perhaps some of those being women), and aggression (defensive or offensive in nature) is triggered by emotional responses to perceived threats, both internal and external. Every natal chart has a “ruling planet,” even that of the Modern State of Israel. The planetary ruler of a natal chart is the planet associated with the constellation on the ascendant (“rising sign”) of the chart – in the case of Israel’s chart, that is Venus at 29 degrees (the “ultimate” or “critical” degree of any of the twelve Zodiac signs) of Venus-ruled Libra, the sign of partnership, justice, and judgement. Even though the majority of Israel’s natal 1st House (her “personality” or how she presents to the world, her outer “dress” so to speak) is contained within the Mars (Ma’adin in Hebrew)-ruled sign of Scorpio, her actual 1st House cusp at 29 Libra describes her beauty, her sense of partnership with the many diverse peoples who make up her population (Kibbutz Galuyot), her internalized ideals of justice and righteousness, and the impetus to be “fair and balanced” in all things. Venus will be Retrograde in the sign of Scorpio (Ekrav), in Israel’s natal 1st House, from October 5th until November 16th. By the time Venus Retrograde is over, she will have backtracked into Israel’s 12th House, triggering subconscious / unconscious defensive reactions against perceptions of unfair treatment by others, particularly around diplomacy (also ruled by Libra). Venus returns to her original Retrograde point of 11 degrees Scorpio by December 17th, and some of the manifestations of this transit may include secret diplomatic efforts, sub-rosa negotiations, undercover operations, and the repair of relationships with “partners” which may have frayed. Jupiter’s retrograde in Scorpio and Sagittarius April 10 – August 11th occurs within Israel’s 2nd House. In plain English: setbacks and impediments in the material world and the financial markets. Reverses in inflation (deflation?) and perhaps deflated hopes in commodities that were thought to be the “next big thing” (crypto-currencies?) may occur during this time. Saturn’s retrograde in Capricorn from April 30th to September 18th occurs within Israel’s 3rd House of communication and immediate environment. Obstacles and difficulties in the communications infrastructure may lead to a security breach. The retrograde of Uranus (Oron in Hebrew) in Taurus and Aries (Taleh)which began on August 7th, 2018 will station direct on January 6th, 2019. Instability and surprises in 7th House matters: equal partnerships (or partnerships that are supposed to be equal), issues of justice and equity which may have been triggered by this retrograde will be steered in the right direction after Uranus re-enters Taurus and begins in earnest his 7-year journey through Israel’s 7th House. At the end of this process, sometime in early 2025, Israel will have a completely different and transformed relationship with “partners” they thought they had prior to 2018. Mercury Retrograde in Sagittarius from November 16 until December 5th occurs mostly within Israel’s 2nd House, the place of her values, valuables, resources, and all “material world” Misunderstandings and miscommunication around issues of money, property, possessions and belongings may occur, particularly involving “foreign” entities. This could be anything from confusion, new rules or revisions to old rules regarding foreign ownership of real estate and property. Mercury Retrograde in Pisces (Dagim) from March 5th – March 26th takes place within Israel’s 5th House, the place of romantic love, pleasure, the “inner child,” creativity, children and all “creations” which are symbolically the offspring of the creative, and all manner of “play.” Israel’s experience of Mercury retrograde in dreamy, imaginative Pisces may trigger a misreading of social and diplomatic signals, over-reaction to criticism, or feelings of victimization at the hands of those she considers to be her “creations” or offspring. Mercury Retrograde in Leo and Cancer from July 9th – August 2nd begins at 4 degrees Leo, the exact degree of Israel’s natal Moon in Leo in her 10th House (public self), backtracking into Israel’s 9th House – the place of religion, philosophy, higher education, “foreign” or exotic people, places and things, and long-distance travels. Mercury Retrograde on Israel’s natal moon may well signal a feeling of being misunderstood by “foreigners” or those outside the boundaries of Israel’s identity – but because Mercury will make a conjunction to Israel’s Midheaven and thereby an opposition to her 4th House cusp (“home” and “family”), misunderstandings and extremely heated, emotional miscommunications may come from those that Israel might normally consider to actually be family – perhaps the Jews of the Diaspora, or Israelis within Israel proper who raise a critical voice. This Mercury Retrograde echoes some of the previous themes, i.e. feelings of victimization or betrayal by “family.” Remember that these perceptions are entirely subjective, and that one of helpful aspects of Mercury Retrograde is the ability to review and re-write past agreements, contracts, and partnerships – but not until the retrograde has passed. The retrograde period itself is an opportunity to review and rewind, polish and perfect. The final Mercury Retrograde of 2019 occurs from November 1st through 18th in the sign of Scorpio. While these dates fall in the year 5780, it’s worth mentioning that this relatively short retrograde in Israel’s 1st House re-triggers the very issues brought up by the retrogrades in March and July. All three Mercury Retrogrades discussed are mostly in Water Signs: Pisces, Cancer, and Scorpio. Water is emotion, and Mercury Retrograde in a Water Sign is a recipe for mixed signals, messed up communications, and murky misconceptions. The Modern State of Israel (which, to my knowledge, does not regularly consult a Jewish astrologer, although she should) might keep in mind that preconceived notions make powerful potions for stirring up strife. Offense is taken, not given. Israel: Pass-Over perceived insults during 5779/2019 and you’ll save yourself a world of hurt. We need not stoop to conquer!